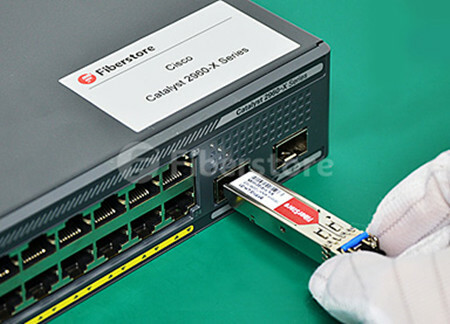 When it comes to optical modules, the brand Cisco especially their Cisco SFP+ modules will be mentioned by almost everyone in optic fiber field. As one of the worldwide leaders in IT and networking, Cisco has dedicated to networking equipment design and manufacture for several decades. Among their all sorts of product lines, SFP+ modules have enjoyed a widespread reputation. In the context of that, in this article, we are going to make an overall exploration of the Cisco’s superstar product: Cisco SFP+ module. Like the general SFP+ transceivers, Cisco SFP+ modules are kinds of optical devices designed for 8 Gbit/s Fibre Channel, 10 Gigabit Ethernet and optical transport network standard OTU2, supporting data rates up to 16 Gbit/s. With various Cisco SFP+ module types, a wide variety of 10 Gigabit Ethernet connectivity options for diverse networking environments, like data centers, enterprise wiring closet, and service provider transport applications can be offered. Altogether, Cisco SFP+ modules consist of Cisco SFP-10G-SR, SFP-10G-LR (LRM), SFP-10G-ER and SFP-10G-ZR, etc. You can refer to the table displayed as below for detailed specifications of Cisco SFP+ modules. How to Choose Cisco SFP+ Modules? If you want to buy Cisco SFP+ modules, it’s sensible to put their optimum transmission distance and compatibility with other Cisco devices into consideration. As for the transmission distance, basically, the ranges between 100 m to 400 m and 10 km to 80 km are commonly seen. For the distance from 100 m to 400 m, we usually use Cisco 10G multimode SFP+ transceiver. For example, if you want to buy a Cisco SFP+ module for transmission within 300 m, then the Cisco SFP-10G-SR module will be the best choice. More information about the optimum transmission distance of Cisco SFP+ modules, you can refer to the table above. Apart from distance, another important thing you should be clear about is the SFP+ module’s compatibility with other Cisco devices. You may wonder if this Cisco SFP+ Module can connect with other devices, such as SFP modules. The answer is NO. 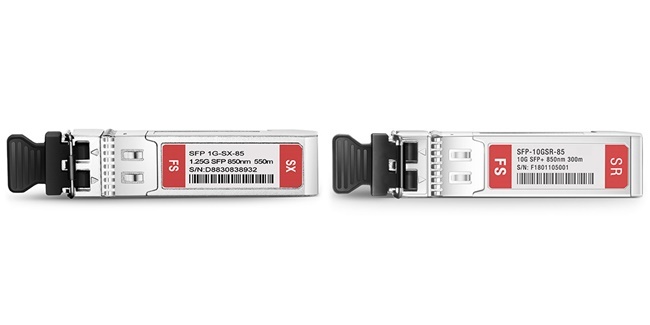 For example, If you connect the SFP-10G-SR with Cisco GLC-SX-MMD SFP transceiver (1 Gbps only), they may not be able to work. Since the SFP-10G-SR only runs at 10 Gbps link rate, it means you force SFP-10G-SR to use 1Gbps speed. You can never interconnect them. For more details about the compatibility of Cisco modules, you can search it from their online Compatibility Matrix. By the way, Cisco SFP+ module price sometimes is also troublesome for many buyers. When you search Cisco SFP+ modules online, you will find the price of these modules from original brand retailers is not economical. Therefore, in recent years, using non-original brand retailers optical transceivers in fiber optic network has been a trend. More and more users prefer third-party modules, like FS.COM, pluggable optics as they are assured to be fully compatible with the original brand hardware as well as having a cheap price. 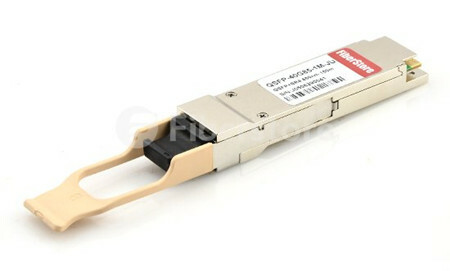 As a leading role in fiber optic network, Cisco SFP+ module has been witnessed a glorious period. But with the unremitting efforts of other manufacturers, undoubtedly, other non-original brand retailers brands will be seen on the rise. For sure, the FS.COM will be that great case. This entry was posted in SFP+ transceiver and tagged cisco sfp+ module, cisco sfp+ module price, SFP on September 14, 2018 by Camilla.Zhang. The small form-factor pluggable (SFP) optical transceiver is one of the protagonists of modern networking, which is a hot-swappable, compact media connector used for telecommunication and data communications. It is designed to provide instant fiber connectivity for your networking devices, such as routers and switches. It is a cost-effective way to connect a single network device to a wide variety of fiber cable for different distances and fiber types, including Ethernet, SONET, single-mode fiber, and multi-mode fiber. Therefore, most people are using SFP optical transceivers for their 1G transmission, especially Cisco SFP optical transceiver. At the same time, there are many problems when using these SFP optical transceivers. This article may summary the problems that may occur and provide the guided solutions for you, as well as give you some notes for maintaining the quality of SFP optical transceivers. Owing to the pollution and damage of the optical interface, its optical link loss become higher, resulting in the optical link fails. Testing the environment of the exposed optical interface, some dust and pollution may enter into the structure. Testing the link ending of optical fibers, because the optical interface may experience second pollution. Testing the interface of the optical connector with pigtail, it may have some improper uses. Testing the quality of fiber optic connectors, you could use the inferior optical fiber connectors. Static electricity will absorb dust, which may change impedance line and affect the life and function of the product. The ESD will damage components, which may work in short-term, but their life is still affected. Avoiding the dry environment, for which easily produce the ESD. Avoiding the abnormal operation. For example, operating the non-hot-swappable optical modules with electricity; directly touching the pin of transceiver module by hand without ESD protection; there is not anti-static packaging during the transport and storage process. Avoiding non ground-connection or bad ground connection. Improving the ESD immunity of electronic components, because the ESD is inevitable. While SFP transceivers are fully-compliant with IEEE 802.3 and the SFP multi-source agreement (MSA), they may not be compatible with some network switch equipment. Because some switch manufacturers program their equipment to accept only their own brand of SFPs. Each SFP module holds its own memory in Electrically Erasable Programmable Read – Only Memory (EEPROM). This memory is coded with unique identifiers. The firmware of the host device will check the memory for the correct information to confirm compatibility. A SFP transceiver will work in any host device as long as it has the correct coding. Advance transceivers are coded specifically to suit each host device to avoid this problem. SFP optical transceiver provides a cost-effective and flexible solution for network designs. I hope this article can help you solve the problems when you are using the products and learn how to avoid these problems. This entry was posted in SFP Transceiver and tagged Cisco SFP Optical Transceiver, SFP, SFP Optical Transceiver on July 1, 2017 by Aria.Zhu. What is the difference between SFP+ and SFP? The pinouts of SFP and SFP+ connectors are identical. However, SFP has a maximum data rate of 5Gb/s whereas SFP+ is designed for 10Gb/s. The SFP receptacles and plugs are not as well impedance matched as SFP+ receptacles and plugs. Also SFP+ cable is designed for 10Gb/s whereas SFP cable may not be able to satisfactorily transmit that rate. What is the distance supported by the SFP+ SR transceiver? The supported distance is up to 300 meters depending on the quality of the multimode fiber (MMF) you use. Quality of MMF is listed as OM1 (up to 33 meters), OM2 (up to 82 meters), OM3 (up to 300 meters), and OM4 (up to 400 meters). Check with the supplier for the cable distance supported. Take GP-10GSFP-1S as an example, it is Dell Force10 10GBASE-SR SFP+ covering a distance of 300m over OM3 multimode cable. Can I use SFP+ cables in SFP ports? Yes, SFP+ cables are compatible to SFP ports and will work fine. SFP cables are not compatible to SFP+ ports. SFP+ receptacles have a mechanical feature to prevent engaging SFP plugs. Do Fiberstore’s SFP+ direct-attach Twinx passive cables work with Cisco or other third-party switches? Fiberstore’s direct-attach SFP+ Twinx passive cables are fully compatible with the original brand like Cisco. For example, SFP-H10GB-CU3M is Cisco SFP+ to SFP+ passive copper cable from Fiberstore which is fully compatible with Cisco switch. The following image shows that our professional trained staff tests the compatibility and interoperability of each optics to make sure our customers to receiver the optics with superior quality. What are the distances supported by cables to use with the 10GBase-T ports? Does Fiberstore offer these cables? Do the SFP+ optical transceivers support 1 GbE operation? Yes, they support 1GbE and 10 GbE dual rates and can be configured for 1 GbE. Will the SFP+ optical transceivers auto-negotiate between 1 GbE and 10 GbE? Auto-negotiation is not supported between the 10 GE and 1 GE speed. The transceiver must be manually configured to operate at 1 GE speed. How do I use the SFP+ ports for 1000BASE-T? You need to purchase Fiberstore’s SFP+ to 1000BASE-T Media Converter. (SFP+/Copper RJ45), part number FMC-1SFP/1RJ45-GB. Is TwinX same as Twinax? Does the Twinx copper cable plug directly into the NIC and the switch? Yes, the copper cable has an SFP+ or QSFP connector on both ends of the cable that directly plugs into the corresponding ports of the switch and NIC. Should I use optical transceivers with the SFP+ and QSFP direct-attach Twinx copper cables? No. These are direct-attach Twinx cables and come with connectors that plug directly into the SFP+ port or the QSFP port of the switch/NIC on either end. Transceiver cannot be used. What is the advantage of SFP+ Twinx copper cable? It is a low-cost option for shorter distances up to 5 meters. Is 10GBase-T same as 10GBASE-T? Yes. 1GBase-T is shorthand for 1000BASE-T and 10GBase-T is same as 10GBASE-T; they are the twisted pair implementations of 1 GbE and 10 GbE respectively. 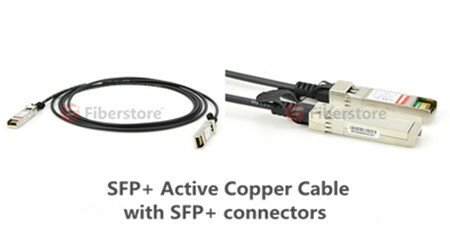 What are the SFP+ copper cables provided by Fiberstore? 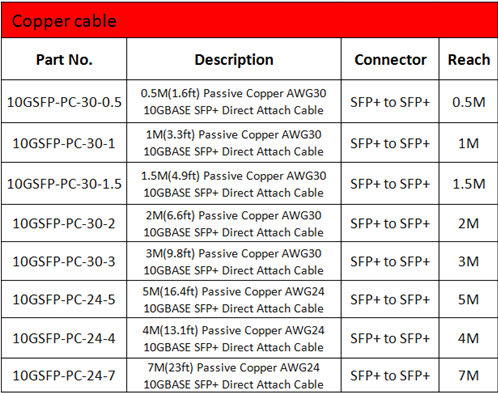 The above chart lists detailed information about some of the 10G SFP+ cables from Fiberstore. We also offer SFP+ copper cables that are fully compatible with major brand like Cisco, Juniper, Brocade, etc. The supported distance of this cable varies from 0.5m to 7m. Users can connect our SFP+ copper cable with top-of-rack (ToR) switch to realize 10G connectivity. For more information, please contact us directly. This entry was posted in Fiber Optical Transceivers and tagged 10GBASE-T, Cisco SFP+ to SFP+ passive copper cable, Dell Force10 10GBASE-SR SFP+, GP-10GSFP-1S, OM1, OM2, OM3, OM4, QSFP+, SFP, SFP-H10GB-CU3M, SFP+ cable, SFP+ Twinx copper cable on March 24, 2016 by Angelina.Li. Gigabit Ethernet has been regarded as a huge breakthrough of telecom industry by offering speeds of up to 100Mbps. Gigabit Ethernet is a standard for transmitting Ethernet frames at a rate of a gigabit per second. There are five physical layer standards for Gigabit Ethernet using optical fiber (1000BASE-X), twisted pair cable (1000BASE-T), or shielded balanced copper cable (1000BASE-CX). 1000BASE-LX SFP and 1000BASE-SX SFP are two common types of optical transceiver modules in the market. Today’s topic will be a brief introduction to 1000BASE-LX and 1000BASE-SX SFP transceivers. 1000BASE in these terms refers to a Gigabit Ethernet connection that uses the unfiltered cable for transmission. “X” means 4B/5B block coding for Fast Ethernet or 8B/10B block coding for Gigabit Ethernet. “L” means long-range single- or multi-mode optical cable (100 m to 10 km). “S” means short-range multi-mode optical cable (less than 100 m). 1000BASE-SX is a fiber optic Gigabit Ethernet standard for operation over multi-mode fiber using a 770 to 860 nanometer, near infrared (NIR) light wavelength. The standard specifies a distance capability between 220 meters and 550 meters. In practice, with good quality fiber, optics, and terminations, 1000BASE-SX will usually work over significantly longer distances. This standard is highly popular for intra-building links in large office buildings, co-location facilities and carrier neutral internet exchanges. 1000BASE-SX SFP transceiver works at 850nm wavelength and used only for the purposed of the multimode optical fiber with an LC connector. 1000BASE-SX SFP traditional 50 microns of multimode optical fiber link is 550 meters high and 62.5 micron fiber distributed data interface (FDDI) multimode optical fiber is up to 220 meters. Take EX-SFP-1GE-SX as an example, this SX fiber transceiver supports DOM function and the maximum distance of the SX SFP is 550 m. The 1000Base-SX standard supports the multimode fiber distances shown in table 1. Specified in IEEE 802.3 Clause 38, 1000BASE-LX is a type of standard for implementing Gigabit Ethernet networks. The “LX” in 1000BASE-LX stands for long wavelength, indicating that this version of Gigabit Ethernet is intended for use with long-wavelength transmissions (1270–1355 nm) over long cable runs of fiber optic cabling. 1000BASE-LX can run over both single mode fiber and multimode fiber with a distance of up to 5 km and 550 m, respectively. For link distances greater than 300 m, the use of a special launch conditioning patch cord may be required. 1000BASE-LX SFP is intended mainly for connecting high-speed hubs, Ethernet switches, and routers together in different wiring closets or buildings using long cabling runs, and developed to support longer-length multimode building fiber backbones and single-mode campus backbones. E1MG-LX-OM is Brocade 1000BASE-LX SFP, this LX single-mode transceiver operates over a wavelength of 1310nm for 10 km. Many vendors use both LH and LX/LH for certain SFP modules, this SFP type is similar with the other SFPs in basic working principle and size. However, LH and LX/LH aren’t a Gigabit Ethernet standard and are compatible with 1000BASE-LX standard. 1000BASE-LH SFP operates a distance up to 70km over single-mode fiber. For example, Cisco MGBLH1 1000BASE-LH SFP covers a link length of 40km that make itself perfect for long-reach application. 1000BASE-LX/LH SFP can operate on standard single-mode fiber-optic link spans of up to 10 km and up to 550 m on any multimode fibers. In addition, when used over legacy multimode fiber type, the transmitter should be coupled through a mode conditioning patch cable. 1000BASE-LX SFP and 1000BASE-SX SFP are the most commonly used components for Gigabit Ethernet application. With so many types available in the market, careful notice should be given to the range of differences, both in distance and price of multimode and single-mode fiber optics. FS.COM offers a large amount of in-stock 1000BASE SFP transceivers which are compatible for Cisco, Juniper, Dell, Finisar, Brocade, or Netgear in various options. If you have any requirement of our products, please send your request to us. This entry was posted in SFP Transceiver and tagged 1000Base-LX, 1000BASE-LX SFP, 1000BASE-LX/LH SFP, 1000BASE-SX, 1000BASE-SX SFP, 1000BASE-X, EX-SFP-1GE-SX, LX single-mode transceiver, SFP, SX fiber transceiver on March 15, 2016 by Angelina.Li. Optical fiber transceivers are also called fiber optic transmitter and receiver, which are used to send and receive optical information in a variety of different applications. The role of the optical module is photoelectric conversion. These optical modules are scalable and flexible in their use, and this is why they are preferred by designers. Here is what you need to know about the basics of fiber optic transceivers. Fiber optic transmission system consists of a transmitter on one end of a fiber and a receiver on the other end. The transmitter end takes in and converts the electrical signal into light, after the optical fiber transmission in the fiber cable plant, the receiver end again converts the light signal into electrical signal. Both the receiver and the transmitter ends have their own circuitry and can handle transmissions in both directions. Fiber optic cables can both send and receive information. The cables can be made of different fibers, and the information can be transmitted at different times. The following picture shows a fiber optic datalink. There are four types of fiber transmitters used to convert electrical signals into optical signals. These sources of fiber optic transmitters include: distributed feedback (DFB) lasers, fabry-perot (FP) lasers, LEDs, and vertical cavity surface-emitting lasers (VCSELs). They are all semiconductor chips. Take QSFP-40G-UNIV as an example, it is Arista QSFP-40G-UNIV compatible 40G QSFP+ transceiver. It uses DFB lasers as sources for fiber optic transmitters, which are used in long distance and DWDM systems. DFB lasers have the narrowest spectral width which minimizes chromatic dispersion on the longest links. The choice of the devices is determined mainly by speed and fiber compatibility issues. As many premises systems using multi-mode fiber have exceeded bit rates of 1 Gb/s, lasers (mostly VCSELs) have replaced LEDs. Fiber optic transceivers are reliable, but they may malfunction or become out-dated. If an upgrade is necessary, there are hot-swappable fiber optic transceivers. These devices make it easy to replace or repair without powering down the device. How Fiber Optic Transceiver Works? Information is sent in the form of pulses of the light in the fiber optics. The light pulses have to be converted into electrical ones in order to be utilized by an electronic device. Thanks to the conversion by fiber optic transceivers: In its fiber optic data links, the transmitter converts an electrical signal into an optical signal, which is coupled with a connector and transmitted through a fiber optic cable. The light from the end of the cable is coupled to a receiver, where a detector converts the light back into an electrical signal. Either a light emitting diode (LED) or a laser diode is used as the light source. Optical fiber transceivers are usually packaged in industry standard packages like SFP, SFP+, XFP, X2, Xenpak, GBIC. According to the fiber type it connects to, there are MM (multi-mode), SM (Single-mode), as well as WDM fiber (CWDM, DWDM modules). 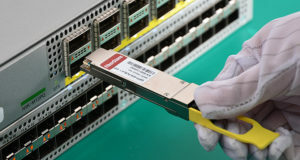 The SFP modules support up to 4.25 Gbps with a connector on the optical end and a standard electrical interface on the other end. The QSFP are for 40 Gigabit networks using a LC duplex connection. Take compatible Brocade 40G-QSFP-LR4 as an example, it supports link lengths of 10km on single-mode fiber cable at a wavelength of 1310nm. Keep in mind that fiber optic transceiver has two ends. One has an optical cable plug and another for connecting an electrical device. Each aspect of the transceivers is necessary to properly deliver a signal to its destination. Be aware of all aspects of fiber optic transceivers to purchase what you need for your application. Fiberstore supplies a wide variety of 40GBASE QSFP+ transceiver modules for you to choose from. More detailed, please contact us directly. This entry was posted in Fiber Optical Transceivers and tagged Arista QSFP-40G-UNIV, Brocade 40G-QSFP-LR4, DFB lasers, fiber optic transceiver, FP lasers, GBIC, LEDs, multi-mode fiber, SFP, single-mode fiber, VCSELs, X2, XENPAK, XFP on December 29, 2015 by Angelina.Li.